At , our top-quality product line mixes style and high performance to meet the needs of today's choosy homeowner. Meet one-on-one with our own in-house window and door design professionals plan your project. We’ll listen carefully to your needs, will work with you to meet your goals, and will watch over your project every step of the way. Are designed for installation in masonry or wood-frame openings. Include a Corrosion Resistant multi-point mortise lock system that comes complete with hardware. Features panels from 4' wide to 24' wide and up to 12' in height depending on manufacturer. Comes standard with laminated impact glass and is also available in insulated glass. Feature hidden installation and assembly screws for visual appeal. Feature unique door options, such as the first four-track, eight-panel, vinyl-framed sliding glass doors on the market. Are field changeable from standard stack to reverse stack. Are available with multi-panel, multi-track by-pass, and pocket or corner configurations. Feature reversible panel interlocks for easy reconfiguration. Meet or exceed all AAMA/WDMA 101/I.S.2/NASF stipulations. Meet or exceed AAMA 1303.5 for forced-entry resistance. Are fully weather-stripped with fin seal polyester pile. Feature high-quality coastal-grade stainless steel or composite hardware. Are manufactured with triple weather seals that reduce air and water infiltration and resist mold and mildew growth. We bring you the complete package — premium-quality sliding glass doors that shield your home from severe weather, help secure it against intruders, add to the beauty of your surroundings, reduce your energy costs, and minimize heat and ambient sound. There’s no need to go anywhere else! : your one-stop-shop for sales, service, and installation of the finest quality Residential Sliding Glass Doors. 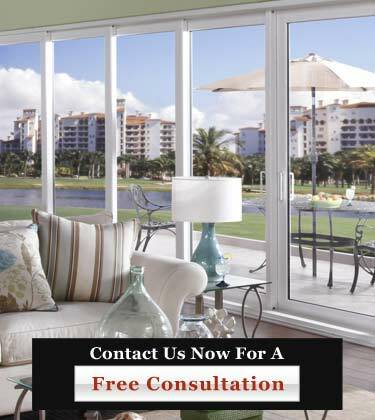 Call us today at (954) 714-6800 or contact us online now for a comprehensive consultation about your next residential Sliding Glass Door project.